You may be asking yourself; What is Portable Appliance Testing (PAT) exactly and Am I required to do it? The article to follow will help you answer any questions you have about the process and how to do it. 1 WHAT is Portable Appliance Testing? 1.1 WHO will do the Portable Appliance Testing(PAT)? 1.2 WHY do I have to perform Portable Appliance Testing? 1.3 WHEN do I have to perform Portable Appliance Testing? 1.4 HOW do I perform (PAT) or Portable Appliance Testing? The technical description for Portable Appliance Testing is when the electrical equipment is examined to make sure they are safe to use. Usually, this can be done with a simple visual examination however, some defects can only be found through testing. This being the reason why it is safer to inspect and test the equipment found in your work place. WHO will do the Portable Appliance Testing(PAT)? Equipment Suitability: Will it work for what the appliance be used for? Equipment Condition: Is the appliance in good condition? Electrical Supply: While being used, will the electrical supply be safe? Instruction: Is employee trained to use appliance? Safety Equipment: Is there any protective wear necessary for the job? WHY do I have to perform Portable Appliance Testing? The truth is, there is no legal requirement that states that you NEED to perform Portable Appliance Testing. According to the Electricity at Work regulations 1989, the law requires that any electrical equipment that has the potential to cause injury had to be maintained in a safe environment and in safe conditions. However; it does not specify how often this must be done and who specially needs to do the testing. This also means that there are no legal requirements to label or keep track of records stating that the equipment has been tested. It is suggested that you do so for the safety of your workers. It can also be useful to monitor and review the usefulness of your equipment. WHEN do I have to perform Portable Appliance Testing? Again, there is no law that requires businesses so access their equipment. The law states that the employer must ensure that their equipment will not cause harm. It is suggested that business owners take a risk-based approach and consider the type of equipment they are using, how often it is used, and what it is being used for. If the equipment is bigger and more dangerous, obviously it makes more sense to check the machines more often. However, smaller appliances may be checked through a simple visual test. It is also a myth that appliances need to be checked in a low-risk environment. The equipment should be maintained to prevent danger to the workers. HOW do I perform (PAT) or Portable Appliance Testing? If you plan on performing the Portable Appliance Testing yourself, there are a few steps you can take so that it is done properly. Make sure Battery, Air-powered, or reduced voltage equipment is not surrounded by a damp environment. If the environment is conductive with restricted movement, extra precautions must be taken to ensure safety. Check to see if the atmosphere is explosive. Ensure that work can be done safely with the correct equipment. Usually, faults can be found during a visual inspection. First things first, make sure that any equipment is off before you begin your inspection. Next, check the electrical cable for any damage or repairing. There should not be insulating tape or any unsuitable connectors. Check your equipment for any burn marks or staining. This may be a sign that the equipment is overheating. If you find anything wrong with your equipment, this must be fixed immediately. The safety of your workers is very valuable to your work space. If work needs to be done, make sure you have a trained, competent person doing the job. If not, it may be worth it to hire a professional. If you enjoyed this and would like some more CSCS revision Material then check out our offer pages. Useful information about PAT testing, we are also providing PAT testing service from at-least 10 years. We work with our professional team and our all team members have 4 years experience in this work. We observed that people have many problems with their appliances this happens because they did not try to check those appliance after some time. 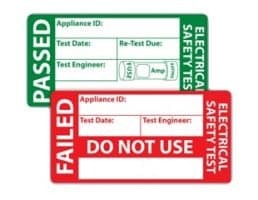 We think PAT testing is very necessary and must be done after 6 to 8 months. You have wrote very useful article relating to PAT testing and Best of Luck for future.